A trully inspirational story about risk management. 3 years ago 4 full time risk managers (Alex Sidorenko, head of risk of the largest sovereign fund, Konstantin Dozhdykov, head of transformation, one of the largest construction companies, Lubov Frolova, head of risk, defence company and Dmitry Shevchenko, head of risk, largest mobile operator) created a non-for-profit entity in Russia called Institute for Strategic Risk Analysis (ISAR). The company had the vision to completely transform the risk management profession in Russia and CIS. Back in 2016 consultants dominated the national risk agenda, pushing for government guidance that contradicted the very principles of ISO31000 and who promoted risk management as a standalone system and not as integral part of decision making, planning and performance management. Government agencies, national risk management association and other institutes were publishing confusing and contradicting messages about risk management, all centered around risk identification, assessment and mitigation. The national risk management association was failing in its duty to develop the profession, with less than 70 members and less than 10 active members (Russia’s population is 140 mln to put things in perspective) and busy with internal politics and smear campaigns. The profession itself was going through rough times, average risk management salary was low, executives did not perceive risk as a value add and risk management staff turnover was huge. Developed a risk management maturity model for the Federal Auditor General focusing on risk based decision making, planning and performance management. This is now used to audit risk management effectiveness at government agencies. Rewrote the national standard for risk management professional that reinforces the need to integrate risk management into decision making and improve how organizations plan, forecast, budget and access performance using risk analysis and national risk management certification program. Huge difference to the current version that contradicts ISO31000 principles and for some bezarre reason encourages separate risk management system. Sadly written by academics clueless about risk management. The new version is now in draft going through public consultations. 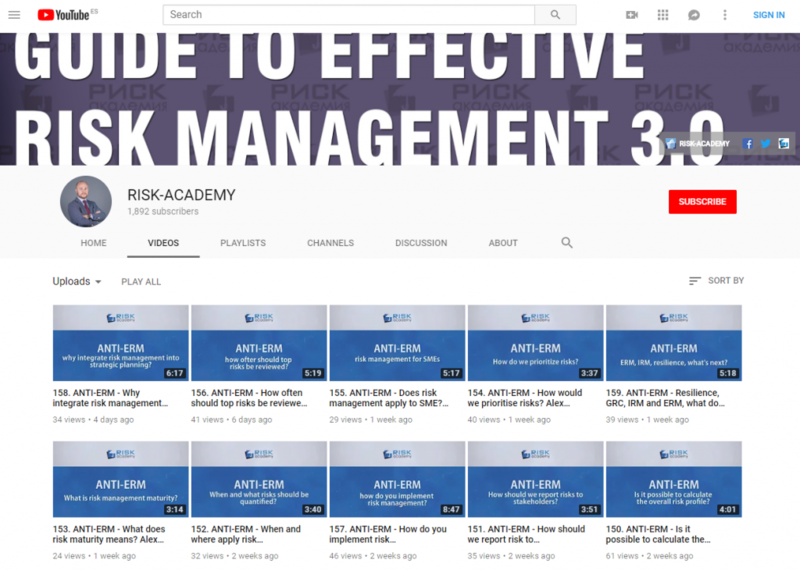 150+ certified risk managers from largest corporations across Russia https://risk-academy.ru/%d1%80%d0%b8%d1%81%d0%ba-%d0%b0%d0%ba%d0%b0%d0%b4%d0%b5%d0%bc%d0%b8%d1%8f-%d0%be%d1%82%d0%b7%d1%8b%d0%b2%d1%8b/. Currently working on a draft risk management standard to promote risk-based decision making across government agencies, based on ISO31000, for the Ministry of Economics. We, together with out collegues at Deloitte, managed to stop the approval of another academic miracle that was encouraging each government to establish standalone risk management systems instead of integrating risk management into decision making, planning and performance management that was bound to cost taxpayers a lot of money. Draft risk management guidance to promote risk-based decision making across government based corporations, based on ISO31000. Ran biggest non-financial risk management conferences 3 years in a row, promoting ISO31000, risk-based decision making and integrated risk management. Number 1 free risk management book in the world, 60000+ downloads in 2 languages https://www.researchgate.net/publication/323254437_FREE_RISK_MANAGEMENT_BOOK_GUIDE_TO_EFFECTIVE_RISK_MANAGEMENT_30 and https://risk-academy.ru/download/risk-management-book/. 316 risk management articles in english and 300 in russian (reprinted in local and international risk management magazines). Risk management content and training provider for IIA Russia, Institute of Independent Directors, Internal Control Association of Russia, ACFE Russia, Gazprom, RZHD, ALROSA, ROSNEFT and other large corporations. More than 1000 executives and top managers trainined. Created 3 interactive offline and 1 online risk management games that are used by universities. 300+ downloads per day from our free risk management template library http://risk-academy.ru/risk-management-templates/. Established and ran the largest ever, transparent risk management awards ceremony in 2018, to be done again in 2019 together with the representative of Central Bank and Ministry of Finance. Actively promoting risk management across Russia and the first to open a Siberian office. Published risk management textbook. New textbook published to be published in february 2019. First ever full risk management course online in russian https://edunano.ru/courses/risk-orientirovannoe-upravlenie-podgotovka-k-sertifikatsii/. All of this was achieved WHILE working full-time as senior risk managers in the largest corporations. Lubov Frolova continued working even on her maternity leave. This is trully a remarkable effort. ISAR team has made risk management history in Russia by rewriting legislation, changing risk management guidelines and standards, rewriting exams, all in the effort to move away from risk management 1 (corporate governance) to risk management 2 (integrated into decision making). Let that sink in. 4 individuals in their spare time created a national platform that achieved 100x the positive impact the national risk management association couldn’t achieve in 15 years. I believe this is the first time ever, anywhere in the world, that a small non-for-profit team made such a possitive impact on the national risk management community. Not with, but despite the national risk management associations. Because we, as a team, had a passion about risk management and courage to challenge the status quo and not accept the risk management 1 just because everyone was doing it or because that’s what the auditors told us. Implementing risk management 2 is going to be a challenge for you too and I wish you the courage to stay the cause! Here are just some of the feedback ISAR team receives from the risk community in Russia https://risk-academy.ru/%d1%80%d0%b8%d1%81%d0%ba-%d0%b0%d0%ba%d0%b0%d0%b4%d0%b5%d0%bc%d0%b8%d1%8f-%d0%be%d1%82%d0%b7%d1%8b%d0%b2%d1%8b/.